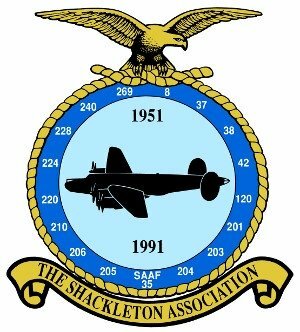 The Shackleton Association was conceived and founded in 1987 by John Botwood, who quickly assembled a dedicated group of mainly ex RAF members who had been associated with the Avro Shackleton during their service career and who were determined that the memory of this great aircraft should never be forgotten. We are not a Preservation Society. It was realised at the outset that we would not have the resources to purchase and maintain a Shackleton aircraft in flying order, or even to have one of our own as a static exhibit. Nevertheless, we are keenly interested in the preservation of the Avro Shackleton aircraft for future generations. Volunteers are required to serve on the Association's Committee. Applicants please contact Peter Dunn. Membership is open to anyone who is sympathetic to our aims and objectives. Although the majority of members are currently ex-aircrew and groundcrew who have been associated with the Shackleton over the years, we welcome serving members of the Royal Air Force and indeed anyone who is an enthusiast of the Shackleton. Through the pages of our quarterly magazine ‘The Growler’, many memories are invoked and numerous friends are reunited after having lost touch due both to time and distance. During each year, we have visits to places of interest and social events where members can get together and reminisce about their life and times and to share with others the topic which is common and dear to all of us - The Avro Shackleton. To provide a forum of mutual appreciation of the Avro Shackleton Aircraft. To maintain a bond between those who are interested in the Shackleton throughout the world. To disseminate news on ALL Avro Shackletons still in existence. To preserve the memory of those who flew and maintained the aircraft and to share their experiences with others. To encourage links with all Maritime Squadrons and their bases, through visits and reunions. You can join us by post or online - please visit the membership page for details.